"A make-ahead appetizer, that looks very pretty on the plate." Just average for us. Hubs and I were both disappointed that we could barely taste the shrimp. If I make these again, I would "up" the amount of shrimp big time! Very good and very easy...plus, it can be made ahead of time. I used the small bay-type shrimp since it was going thru the food processor. It was a hit with the group I made it for. Thanks. 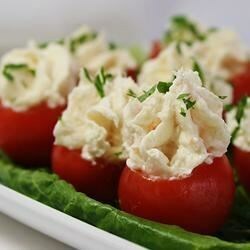 A great summer time appetizer for warm summer party easy to prepare, the taste is fresh and cool.